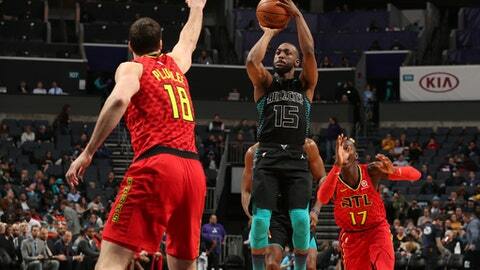 CHARLOTTE, N.C. (AP) Kemba Walker likes the Charlotte Hornets’ chances with Dwight Howard altering shots in the lane. Howard was key in turning back the Hawks’ rally. He finished with 18 points, 15 rebounds and a season-high seven blocks. John Collins shot 4 for 5 for 10 points for the Hawks, who have the NBA’s worst record. With 4:34 left until halftime, Walker went hard to the court after slipping on a drive to the basket and appearing to hit his head on Collins’ knee. He did not leave the game. Hawks: The Hawks have lost six of seven. … Collins attended a game at his alma mater, Wake Forest, against Duke, on the trip. He got a video tribute and warm reception at the game. Howard made a few headlines with a quote Friday that he wanted to ”kill” the Hawks. Atlanta traded Howard to Charlotte in the offseason. With his parents in attendance on his father’s birthday, Bazemore missed his career high by two points. He said he had extra motivation from their presence, despite the team’s status at the bottom of the NBA.